Demand for professionals in construction, property and surveying has never been greater. From The Shard to Battersea Power Station, taking in the regeneration of Elephant & Castle and Nine Elms, there are swathes of new developments which will require large number of building professionals over the next decade. Our alumni hold key positions in their organisations, often as senior managers and business owners. Each course entry has full employability details. Today we are the university of choice for many students entering the architecture and construction industries throughout the UK and much of the world. We have always been at the forefront of surveying. We have awarded the first Royal Institution of Chartered Surveyors (RICS) professionally accredited degrees and diplomas and have been running our Chartered Institute of Building (CIOB) accredited degrees in Construction Management for almost 40 years. Many employers actively seek graduates holding accredited degrees. Accreditations are a mark of quality assurance and professional relevance, which is why it's highly relevant that all construction, property and surveying degrees at LSBU are accredited or developed in partnership with all the leading professional accrediting bodies. Our surveying graduates are open to a wide range of careers including professional consultancy offices, government departments, building control, building management and project management. Find out more about careers in quantity surveying and building surveying. If you're interested in property management you could find yourself working in building control, private and social housing, or the maintaining and management of public, private, commercial and residential buildings. 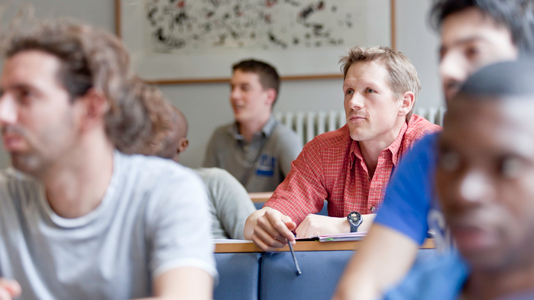 Find out more about careers in commercial management and valuations. Pursuing a career in commercial or construction management could find you working in a construction or specialist firm. Your sound technical knowledge will be put together with general and project management skills to ensure professional managers are well placed to lead multidisciplinary teams in delivering many of the country's high profile projects. Find out more about careers in construction.